Last week I asked you about your least favorite part of blogging. Today I want to ask about where you do your blogging. I do most of my work at my home computer, which is pictured above and below. I have a desk that is much too small so I can’t pile too much on it. Maybe that is a good thing. I didn’t clean it up for the photo but there is often much more stacked on the side of the monitor. There are shelves to the side so a lot of stuff gets put there. Although most of the things on the shelves are games and dvds that have nothing to do with blogging. I do some of my blogging at work during my lunch hour or when I don’t have any work to do. Actually, even though they are already researched, I wrote most of my posts during my lunch hour. That’s why they are rarely posted in the morning. I don’t have a laptop so I rely on a number of online services so I always have the information that I need whether I am at home or at work. I am trying to save up for a laptop but I prefer desktops because I like to play videogames. Gaming laptops are just too expensive. Hmm … that list implies that I am a google fangirl but I’m really not. I like them and their services but am not obsessed with google. Google just seems to provide a number of online services that I need. Actually, I probably like them because I only have to login once to use all of them. So, what does your workspace look like? Do you like it? Is it efficient? Where do you usually work? In the comments feel free to use linking and image code to link to images of your workspace. Or, email them to me and I will post the photos in the comments for you. Either my desk or my laptop. I find myself using my laptop a lot more because I usually blog on the go about what I’m doing right then. Kim, I do all my work from my home office, since I’m retired and have no laptop. I, too, have two monitors, and have for years. I don’t know how I could work if I didn’t have both. My workspace looks like the proverbial cyclone hit it. I am not a neat freak. I generally know where things are, but sometimes I lose stuff in the piles. My wife despairs of the way I keep my office — It’s a good thing it has a door that I keep closed! There’s a picture of my office on the Time Goes By site. It’s from a few months ago, but little has changed, except the stacks have gotten higher! @Wesley – I think ultimately a laptop would make my life easier but I love the dual screens and would still need a powerful desktop computer. @Ajith – Are you asking how to work with two monitors or are you saying you wouldn’t like working that way? Do you use the laptop when you are away from home and then use the desktop when you are at home? 40% of the time I blog at work on my PC desktop, 50% of the time at home on my Mac desktop (teetering on an old drafting table and 20 year old cheap office supply store chair – NOT comfortable) and 10% of the time, I’m blogging on my PC laptop wherever I am. I do a lot of the drafting at work and clean-up/editing, publishing at home. I work nine hour days at my day-job and the rest of my waking hours (almost) are spent working at home. On the weekends, I am either home or out and about with my significant other where I usually have my laptop. Thanks for the information about the tools that you use? Ha ha! Ill have to take a photo when I get home. It’s just the monitor on the table though. My weekend was great, despite the freakish heavy rain, thanks for asking. How was yours? I had to buy a laptop to blog as my husband thought I left him when he never saw me. He uses the desktop and hates when I make any changes so I use the laptop on a dinner tray type table in the living room from my recliner. I have an end stand next to my recliner that I clutter up, clean up, clutter up, clean up! I hate clutter, it doesn’t last very long! @Carla – We had a lot of fun trick or treating on Friday night but it was exhausting. Saturday we went shopping, which I despise, and Sunday we went to see a free movie and did some more drawer organization. I’m looking forward to the photo. @BloggerNewbie – Hmm … is hard to work on a dinner tray? If I had a laptop I would probably work in bed and then fall asleep with the computer rather than with a book. I’m lucky. I have a large desk, a new laptop, and my own room. As comfy as this is, I still think I spend too much time in front of the computer and would like to cut back. Hi Vered – I forgot to mention in the post that my set-up is in a corner of the living room. When I was still married it annoyed me but now I like it because I can sometimes work when Alex is watching a movie or playing and we are still in the same room together. Also, the house I live in is REALLY old and where my desk is located is restricted based on outlets. 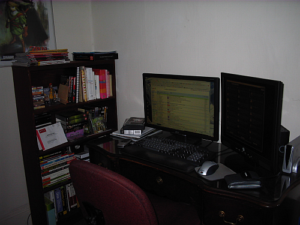 Hi Kim: I blog from my home office. However, it’s uncomfortable for me to type because of the way that I have my computer set up, and I definitely need to find a way to fix this. It just occurred to me that maybe I should saw off a bit from the legs of the table where I have my computer because it’s too high. Yeah, I need to find someone to do this. (I have a nice, large desk and my computer is set up on table next to the desk). I forgot to mention, I have a small office I work out of. The rooms in the house are fairly small so there wouldn’t be much space otherwise. need a new desk set up and a new chair. i think i have out worn them both. Natural’s last blog post – Finger Clicking Good’gaud That Hurts! @ Marelisa – Thanks for much for visiting and commenting! Can you raise the chair instead? I can’t do that because I’m so short my feet wouldn’t touch the floor :-) My chair doesn’t have arms and I really need to get one that does. I can feel the carpal tunnel getting worse. @Carla – It’s good that you have space to work even if it’s small. @Natural – Hmm … a laptop under the bed, huh? I would never get any sleep if I did that. @Dave – Hopefully it will all be over soon. When’s the moving day? Do you have a place when you get there? And I use a lot of Google services too. It is convenient having the one login cover everything. 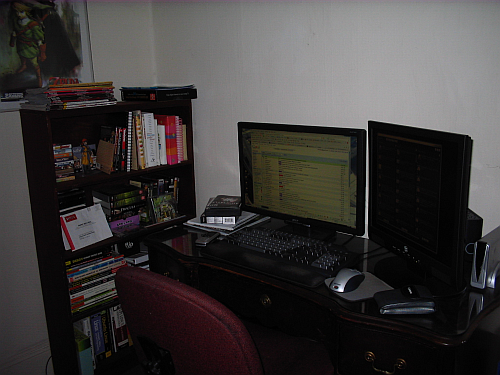 @Madhur – Now that I use the two monitors I don’t think I can go back. It’s kind of like going back to dial up after having high speed internet. 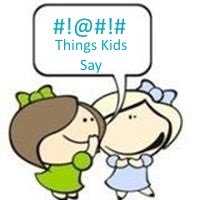 @Kristi – It’s hard to have things packed up for a long time. I’m glad you finally found a good place to live. The one google login is awesome. @Ajith – Both monitors are connected to one computer. You have to have a video card with two ports and then the video card settings allow you to set it up. Mine stretches the one screen onto two screens. Older cards have this capability so I don’t think one would be too costly. I work from my windows laptop ALL the time. Sometimes I do so in bed so I am with my wife and sometimes (usually in the morning) I work from the kitchen table where I can sit up straight and have some “desk” space. Our apartment is small so space is limited. I love the laptop b/c of this AND the portability. From your list, I use google docs and delicious. My email is hotmail b/c I ‘grew up” using it when web based email was still new and am kind of used to it. I think I still have some emails from the 90’s in my box! Hi Tim – Thanks for visiting and commenting. I have a lot of new visitors this week and it’s been great. I can’t believe you have emails going back that far. My oldest ones are from 2001 – I think I changed yahoo accounts at that time. I used yahoo for a long time but eventually switched to gmail. i have got same as yours but one thing is i would not have books near me. lol! Hi Arun – LOL Why wouldn’t you have any books? its cos its far from my blogging table. i learn and read mostly from online. so i dont have the necessity for books near me.